Finding investors to support any startup can be a challenge. Multigenerational startups are catching the eye of investors, but the road to funding can be confusing and challenging for the new startup. 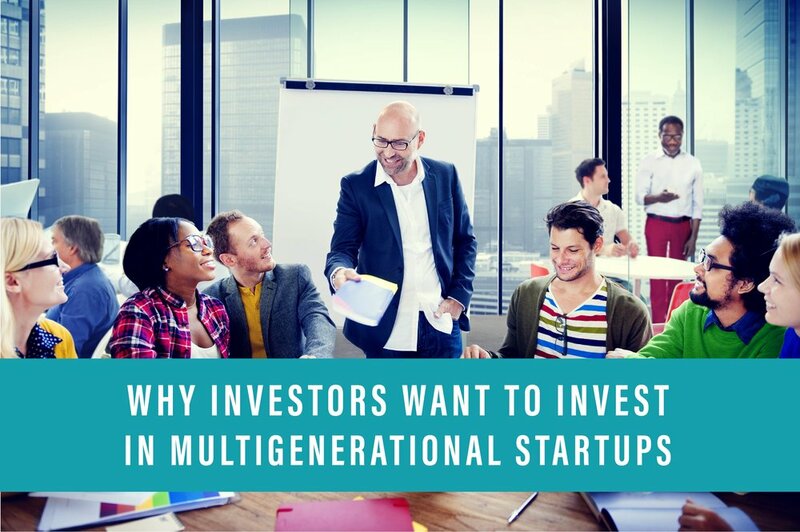 For this week’s post, we ask Peter Adams, Managing Director, Rockies Venture Fund, to give us his insights on why investors want to pursue multigenerational startups and how you can make sure your startup is ready. 4GenNow: Why do you believe investors want to work with multigenerational startups now? Now, more than ever, investors are interested in multigenerational teams because they are demanding so much of startups. Companies need to have industry connections, understand channel development, be up- to-date on the latest technologies used in app development, know how to use social media and advanced marketing tools to track customer interactions, know how to scale a company, understand data, understand values and leadership, know how to build value and make relationships with large potential acquirers. This is a long list and there’s more. It’s unlikely that a mono-generational team is going to bring all of these characteristics to the game and being able to do it all at once at remarkable speed is what investors are looking for. 4GenNow: Based on your experience, are there certain industries that attract more interest from investors than others? Venture capital investors are looking for companies that can grow fast, scale up and be acquired within a 3-5 year period while returning ten times the investment to investors. There is a narrow intersection of maybe 1% of all businesses that fill this description and they tend to be in mobile, internet, software, IoT, AI, general tech, healthcare, medical device, diagnostics and digital healthcare applications. Other disruptive business models fit the bill, though most are going to be tech enabled in some way. 4GenNow: What three things can multigenerational startups do to make themselves attractive to investors? Have a clear path to exit defined for your company from day one. (This is the second of the Seven Habits of Highly Successful People - “Begin with the end in mind.) Most first time entrepreneurs don’t understand the importance or mechanics of the exit and thus they fail to create as much value as experienced founders. Multigenerational startups have an edge in understanding their customer because they come from multiple perspectives. Make sure though, your perspectives match real customer needs and you don’t end up just drinking your own Kool-Aid and go too far in the wrong direction before you find Product Market Fit. Price your investment round realistically. There are some crazy valuations coming out of startups with zero traction in Silicon Valley and few of these companies are actually raising funding. Gather data about what average valuations are in your area and price your deal attractively because investors are looking at a hundred deals or more for every one they write a check for. You are up against serious competition and investors like a deal. 4GenNow: Do you think some multigenerational entrepreneurs are apprehensive about approaching investors and what advice would you give them? Many entrepreneurs of all kinds are apprehensive about approaching investors for a variety of reasons including the need to move quickly towards exit, a loss of control and being fired from the company. In fact, research by former Harvard Business School professor Noam Wasserman reveals by the time startups are three years old, 50 percent of founders are no longer CEOs and by the IPO, fewer than 25 percent still lead their company. In every case I have been involved with, founders have been the ones to suggest a change in CEOs and the founder often takes a COO or CTO role. In other cases, the founder is actually forced out of the company. There are many reasons for this, but the main reasons would be a failure to execute or to scale the company. A multigenerational team is more likely to be successful in scaling and executing than others because they bring experience about the qualitative and quantitative changes that need to happen in rapidly scaling companies (assuming that the senior members of the team actually have experience in this and are not just older). They also are more likely to have closer connections to the markets and may be more tapped into their markets by virtue of having multiple perspectives. If this is the case, then the multigenerational team is less likely to need to be replaced as the company scales and multigenerational startups need not have so much apprehension as an inexperienced first-time CEO might. 4GenNow: We see a lot of people investing in tech startups. What advice would you give to multigenerational startups if they have an idea that isn’t tech related? Tech is popular with investors because it naturally lends itself to scale quickly without huge amounts of capital for inventory or complications of working with a supply chain that can be unpredictable. But not all startups need to be tech focused to interest investors. For example, there is a lively group of investors who are backing companies in the natural food and beverage space. Large brands are playing catch-up with consumer demands for fresher, healthier foods and they are doing that by acquiring startups that develop successful brands. The Annie’s acquisition by General Mills for $820 million is a good example of that. $820 million is a lot of macaroni and cheese! Other VCs are investing in health and beauty, retail, sports equipment and more, so founders should not feel limited to tech only solutions. The main thing for founders to remember is that VCs tend to specialize in just one or a few areas, so it would be a mistake to approach a tech investor with a natural food product company and vice versa. Do your homework on the investor and study their fund thesis and look at what other companies they have invested in to see if your company is a fit. 4GenNow: Multigenerational entrepreneurs provide a unique perspective in the startup world. In what ways, if any, should these co-founders demonstrate their generational advantages to investors? The place to tout your multigenerational advantage to investors is in the team slide and how you present it during the pitch. I wouldn’t specifically call out the fact that you’re a multigenerational team, but I would call out the specific strengths of the individuals that come from their position. The more you can do this in a way that it shows you have all the bases covered, the better. Do you have advice for multigenerational startups trying to get funding? Share them here. Be sure to register for 4GenNow’s Power Summit to hear more of Peter’s insights on how your startup can secure funding.